Make a botanical statement with this large photographic pillow. 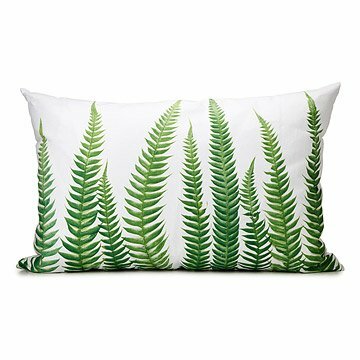 Printed with the botanical art of photographer Barry Rosenthal, these oversized cotton canvas pillows showcase the simple beauty of nature with the familiar forms of bright green ferns. The lush images are enlarged and accentuated on their broad white canvasses, making boldly organic statements for a living room, family room or bedroom that will harmonize with many interior palettes, from rustic to eclectic. Punctuated by the artist's signature, the botanical image continues just past the pillow's front panel, adding to the powerful spatial statement of the design. Made in Hendersonville, North Carolina. Check out Barry's Photobotanicus Timothy Pillow. Machine wash removable pillow case inside out, cold water, gentle cycle, mild detergent. Do not bleach. Tumble dry on low heat. Copyright (c) 2014 - Photobotanicus Fern Statement Pillow artwork owned by Barry Rosenthal and licensed to Uncommon Goods LLC. All rights reserved.